Company C, 2 nd Regiment, U.S.S.S. 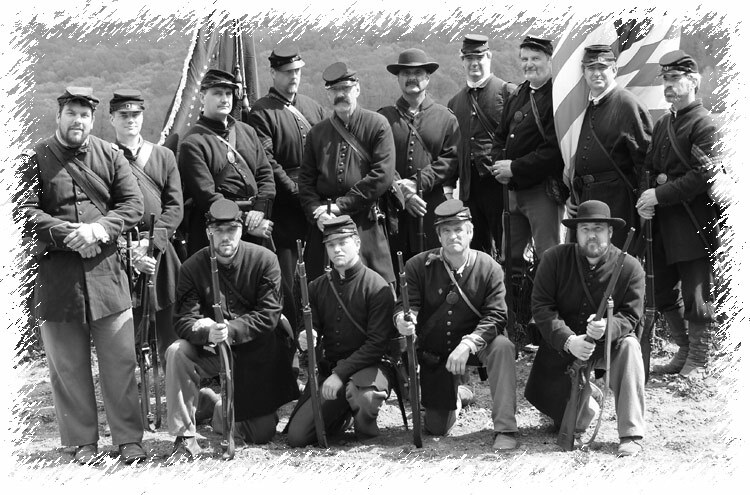 a living history and reenactment group (and registered 501(c)(3) educational organization) whose mission is to educate the public and preserve the memory of the men who served with the First and Second Regiments of United States Sharp Shooters (Berdan’s) during the American Civil War. We achieve our mission by volunteering our time to portray the U.S. Sharp Shooters at National Park Service events and at various local Historical Societies; through presentations at Civil War Roundtables and other educational venues; by conducting research for descendents; and through various other activities such as monument and grave stone clean up and restorations. While we are named for and organized around the Pennsylvania company of Sharp Shooters (Co. C, 2 nd Regt. ), our goal is to honor all the men of the U.S.S.S. and our members reside in a number of states including: Delaware, Maryland, Ohio, Pennsylvania, and West Virginia. Our unit was founded in 1977 by Carl Ellerman of Landisburg, Pa. Carl developed the Sharpshooter impression to help round out uniform demonstrations for the unit that he was a member of at the time, the 7th Pennsylvania. Prior to his retirement from the hobby in 1983, Carl conducted extensive research into the uniforms, equipment, and rosters of the Sharpshooters. Following Carl's retirement, the driving force behind the unit was Art Buker of Catonsville, Md., a tireless researcher who for years carried on a one-man mission of keeping alive the memory of this unique regiment. Alone, and somewhat out of place amidst regular infantry units at living history events, Art would set up his display and patiently explain to visitors that there was more to the Civil War than muzzle loaders and blue uniforms. Over the years, Art's single-minded mission paid off as Company C now has more than 40 members with about 16 - 20 who regularly turn up in uniform at the larger events. Although we participate in occasional battle reenactments, our focus is on living history events for the National Park Service. We volunteer annually for events at Antietam, Gettysburg, Malvern Hill, Manassas, and Yorktown battlefields. Our membership is made up of people with diverse backgrounds and walks of life who share a common love of history and desire to honor those who came before us. Several of our members are descendents of men who served with the Sharp Shooters or other Civil War units. Many of our members conduct extensive historical research to improve the sharp shooter impression, enable members to inform spectators about the sharp shooters, and gain a better understanding of the lives and issues addressed by the people during the American Civil War. If you think you would like to join our group, please send an email to our unit at webmaster@berdansharpshooters.com or stop by and speak to us at one of the events listed on our schedule. This site was last modified November 16, 2014 .